The Mother Spawn on set. 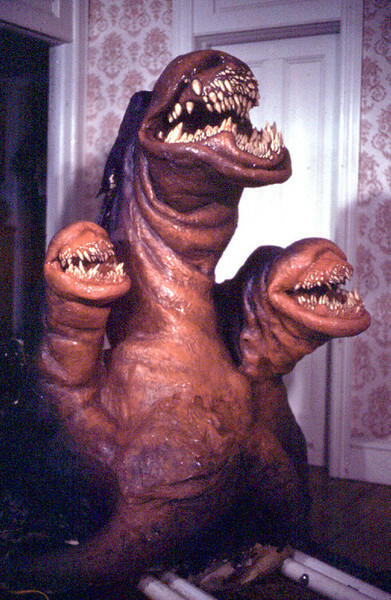 For the first sequence involving the monster, in which it is mostly off-screen, only a shadow is shown; the effect was produced with a simple cardboard composite, projected onto the tent. The Spawn is next seen when it attacks and violently devours Charles’ parents. This stage, nicknamed the ‘Mother’ Spawn or the ‘Mama’ Spawn by the special effects crew, was created as a full-size mechanical puppet. It was first sculpted in clay and then moulded. The mechanical understructure, which featured rough mechanisms allowing jaw closure for its three heads and arm movement, was covered with a skin made in sheet foam rubber. Said skin was draped with liquid latex-coated paper towels; this gave additional texture to the Spawn’s skin. The monster’s overlapping teeth were instead moulded in actual dental acrylic and polished with powdered pumice stone. “I really wanted to be a dentist,” Dods jokingly commented. The ‘Mama’ Spawn with effects technician Greg Ramoundas. 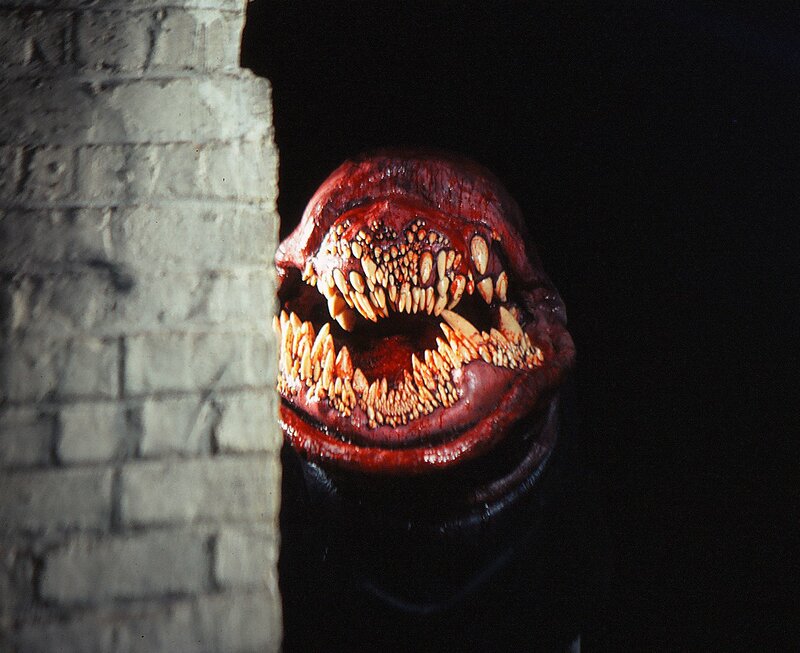 The ‘Mama’ Spawn was built in John Dods’ basement; when the time came to bring it on set, the crew realized that it was actually too large to pass through the doorway that led to the shooting set. One of the puppet’s three heads was thus removed, only to be reassembled onto the main body once inside the set. For the 4-5 shots from the inside of the Spawn’s maw, a specific camera rig was built with rough mechanisms that enabled the jaws to open and close. The monster spawns dozens of quickly-growing offspring. A good number of puppets was built; much like the ‘Mama’ Spawn, the younger creatures were covered with a sheet foam rubber skin — but lacked the paper towel treatment. Those stages of the life cycle include newborn creatures, no more than a few inches long, more serpent-like young spawns, and subadult spawns already displaying rudimentary arms sprouting from their sides. All the Spawn puppets featured rough mechanisms that allowed jaw movement. The so-called ‘mini-spawns’, the first stage, are first seen swimming in the layer of water of the basement. This effect was achieved by sliding or wire-pulling baby Spawn puppets through pre-cut tracks in the floor. The flexibility of the rubber allowed fluid movements. The whole construction of this simple effect only costed around 50 dollars. John Dods works on the slithering Spawns and the tracks. 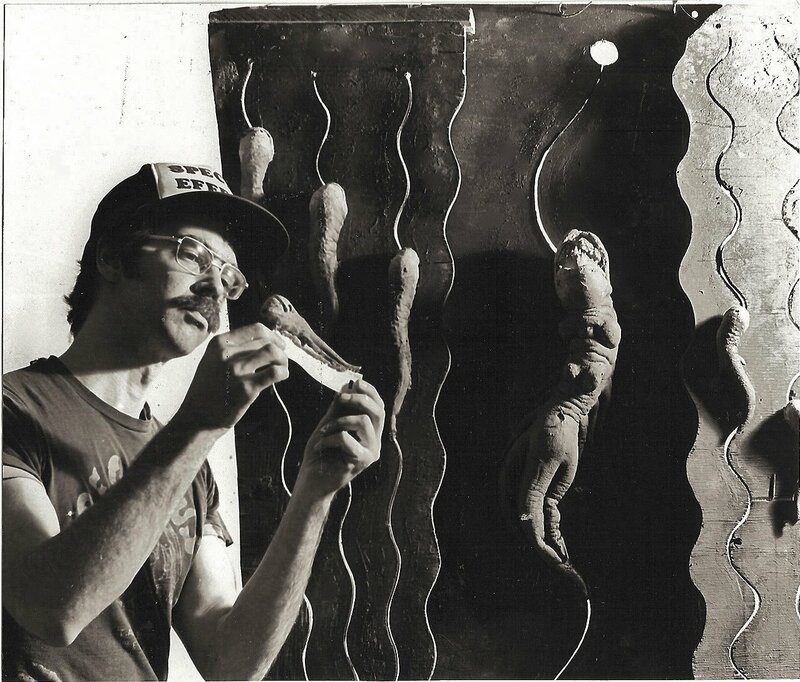 The same basic concept was used for the bigger Spawns seen slithering on walls: similar tracks were cut, and the models were either dragged with a wire or moved from the other side of a set wall. When the young Spawn slithers into the food processor, it was operated from its right side by a puppeteer. In the final shot of the twist ending of the film, a gargantuan Spawn head rises from under the hill near Charles’ house — roaring in the night and into an uncertain future. The giant Spawn was created as a miniature model, with only a basic mechanism for its head to rise up and its jaws to move. Once again, the skin was made with the precedently described ‘paper towel’ technique. 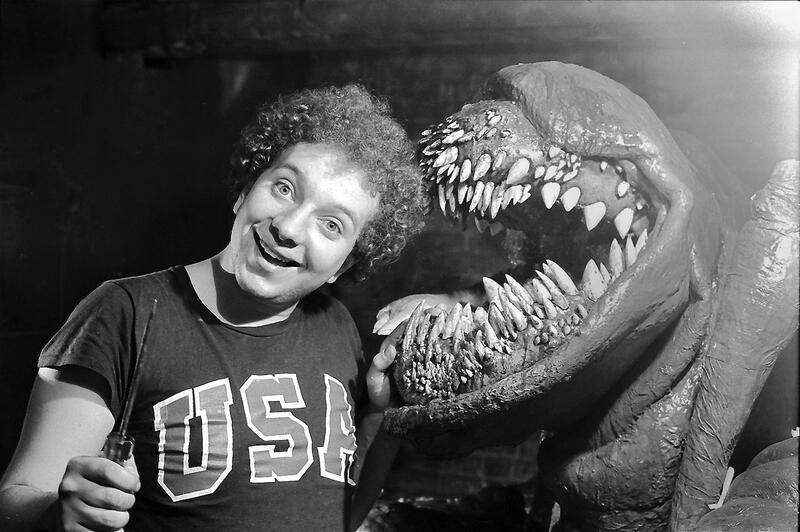 The teeth of the creature were this time moulded in plaster — due to budget restraints — and sprayed with clear coat to achieve visual continuity with the other creatures. 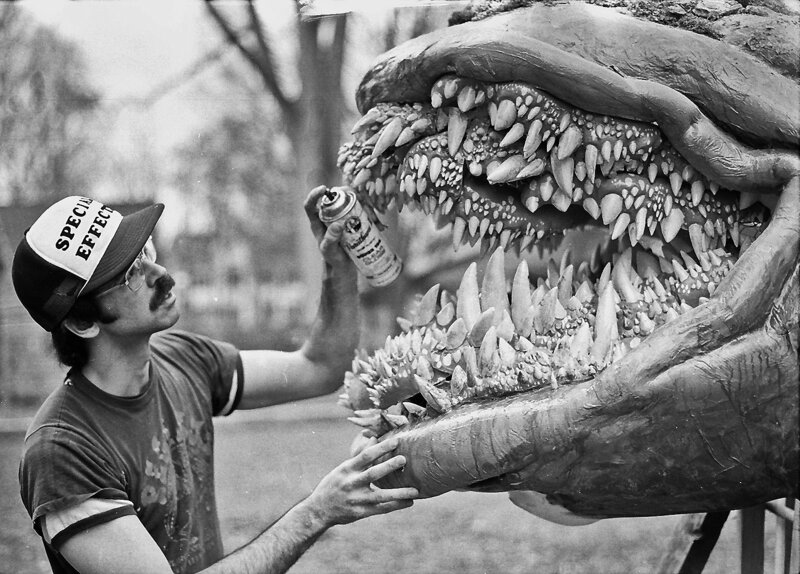 John Dods works on the giant Spawn’s teeth — applying clear coat to achieve a shining effect. For more pictures of the Deadly Spawn, visit the Monster Gallery. Posted on 19/03/2013, in Movie Monsters and tagged John Dods, The Deadly Spawn. Bookmark the permalink. Leave a comment.